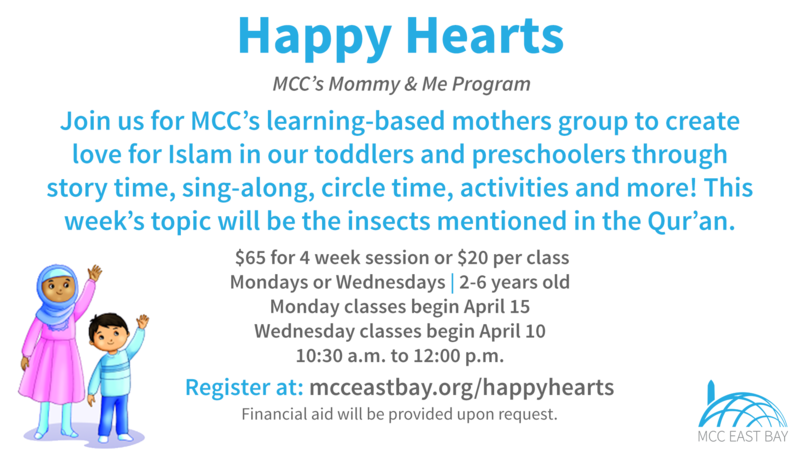 Join us for a new session of MCC’s toddler playgroup as we learn about insects mentioned in the Qur’an. In each session, we learn about our faith and loving Allah and our deen through stories, singalong, snack, craft and parachute time! CLASS STRUCTURE: Our day begins with dua, a salaam/greeting song, then guessing the topic of the day. We will then learn our Arabic letter of the day and then begin singing our theme related songs, and reading our colorful books. Next, we will recite Surah Fateha and together eat a special snack, and then move on to work on our beautiful take-home craft and exciting stations! We will end our day with our handheld Fi-Amanillah song and…a kid favorite…parachute time! Fee $20 Time : 11:30 a.m. – 1 p.m.
REFUND POLICY: Refunds not available after the session begins. Missed classes are not refundable. You are welcome to make up for it another day with prior notice. Contact me directly for extenuating circumstances.